If you travel frequently, you know the challenge of sticking to your fitness plan when you’re on the go. Planning hotel-friendly workouts and diet-friendly meals takes a little bit of extra thought, but staying active and making healthy choices will leave you feeling revitalized when you return from your trip, instead of worn down or sluggish. The key to staying fit, especially when you’re traveling is staying hydrated. Drinking plenty of water not only helps you lose weight, but it aids in your circulatory system, your digestion, and your immune system, it improves your skin’s complexion, flushes toxins, and fights the fatigue that all-too-frequently accompanies travel. It can also make you feel fuller, and therefore eat less than when you’re feeling dehydrated. If you’re traveling by plane, pack an empty water bottle in your carry-on that you can fill once you make it through the security checkpoint. Not only will this save you money by avoiding expensive airport beverages, but it will keep your body hydrated and happy during your travels, too. Whether you are traveling for business or pleasure, there’s no better way to acclimate yourself to new surroundings than on foot. Set your alarm early, plan your route, and get your blood pumping, all before your first business meeting. You may even run past a coffee shop or bookstore to check out later that you may not have noticed otherwise! If you’re visiting a beach, you can get extra mileage (literally) out of a beach run and give yourself an extra challenge by running in the sand. When visiting Oklahoma, you can also run in one of the many gorgeous state parks. Check out a list here and plan your next run or hike during your travels through the Sooner State. Whether you’re into yoga, pilates or, kickboxing, traveling to a new city is the perfect opportunity to explore new fitness opportunities. Get a visitor’s pass to a local gym or studio, or drop in for a class near your hotel. A new yoga instructor may give you new insight into your favorite pose, or you may find a new favorite workout to explore once you return home. Visiting Oklahoma or Oklahoma City? Check out the Science Museum of Oklahoma, where they’ve made science and fitness a major focus of their museum. Learn a bit more about your body, and get active walking through the museum all at the same time! Many hotels have gyms, but they may not always be stocked with weights or the same equipment you’re used to having at your gym in your hometown. Rather than traveling with bulky (and heavy) equipment like weights, plan your workout around exercises using your body weight for resistance. 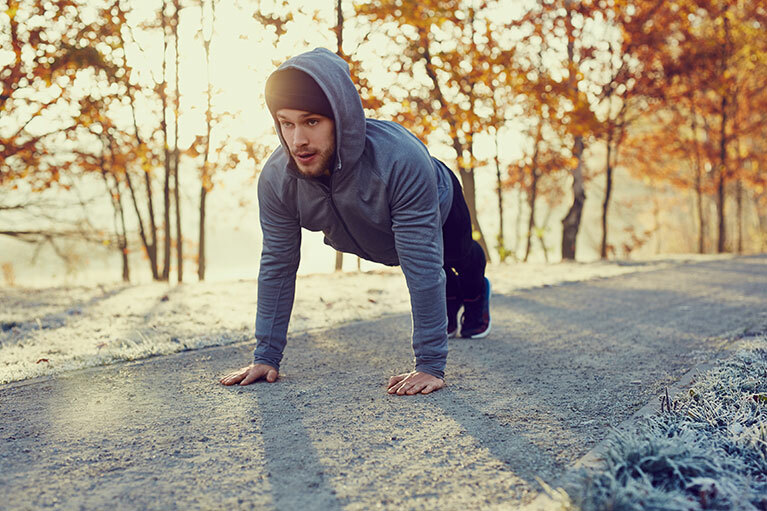 Moves like planks, push-ups, burpees, jump squats, lunges and mountain climbers can all give you a good workout and get your sweat flowing without extra machinery. Ask your personal trainer for some exercises that are easy to do no matter where you are. Sure, it can be challenging to maintain your normal diet when you are traveling. You are frequently eating out, and you don’t always have regular access to a kitchen. When dining out, choose lean meats and steamed veggies whenever possible, and make lean, healthy salads your new best friends. You can also find a nearby grocery store and stock up on healthy snacks like fresh fruit. Most grocery stores also have fresh salad bar available, so you can make your own salad for a healthy, quick meal choice. If you absolutely have to do fast food, check out this list of some of the healthiest fast food choices you can make when you’re on the go, so you never have to sacrifice your fitness goals, no matter where you eat. Also, when you’re traveling, drink smart. If you’re planning to enjoy an alcoholic beverage or two, don’t go overboard, just because you’re on vacation. Here’s a list of low calorie, dietician-approved drinks to order on your next trip, so you derail your fitness plan at the bar. No matter the length of your hotel stay or next trip, fitness can remain a priority for you with a little extra thought and planning. Looking for new ways to revitalize your fitness plan, especially if you’re always on the go? Contact Elite Training to see how we can help you work towards achieving your fitness goals!